A bold move pays off for the winner of Stage Two of the KISS Super League, as the Zwift All Stars team takes the overall lead. Stage Two began with the usual sprint out of the starting gate, putting several riders in difficulty early in the first lap. The Zwift Academy Dream Team and Zwift All Stars drove the pace up the first climb, causing more splits in the peloton. By the start of the second lap, only 22 racers remained in the lead group. Patrick Christopher (Zwift Academy Dream Team) led the pack up the second climb, shaving the group’s number down to 20. The third climb saw Ryan Christensen (Canyon dhb p/b Bloor Homes) taking over at the front. New to the Super League this week was an intermediate sprint competition, where racers could earn points for crossing first, second, and third at the banner. 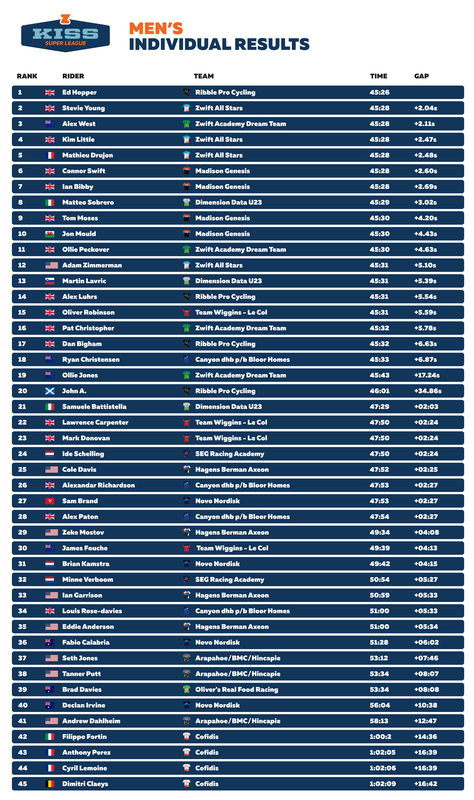 Three out of the four sprints went to Kim Little (Zwift All Stars), but Dan Bingham and Alex Luhrs of Ribble Pro Cycling put up a strong fight, as did Connor Swift (Madison Genesis). The sprint point came shortly after the climb on every lap, giving the racers an extra test without much chance to recover. With about 9 kilometers to go, Ed Hopper (Ribble Pro Cycling) powered off the front. His attack wasn’t showy, but it was strong, opening up a gap of a few seconds as the race entered its final lap. A solo attack this far out from the finish was risky, with a powerful group chasing behind. But against the odds, Hopper kept pulling out the gap. And the gap only got bigger. At the base of the final hill climb, he nearly had a 50-second lead on his rivals. His draft truck PowerUp didn’t help much—there was nobody to draft. The chase group hit the incline hard and fast, letting featherweight PowerUps fly as they tried to close down the lead rider. They shrunk the gap to 30 seconds. Still, Hopper pressed on. The chase behind had a lot of help from Tom Moses, as he worked to defend his Madison Genesis team’s position in the overall standings. Coming into the finish, his teammate Connor Swift opened up a long sprint, but it was too late. Hopper held on to win the stage. Just two seconds behind, Steve Young (Zwift All Stars) came in second, taking the bunch sprint ahead of Alex West (Zwift Academy Dream Team) in third. 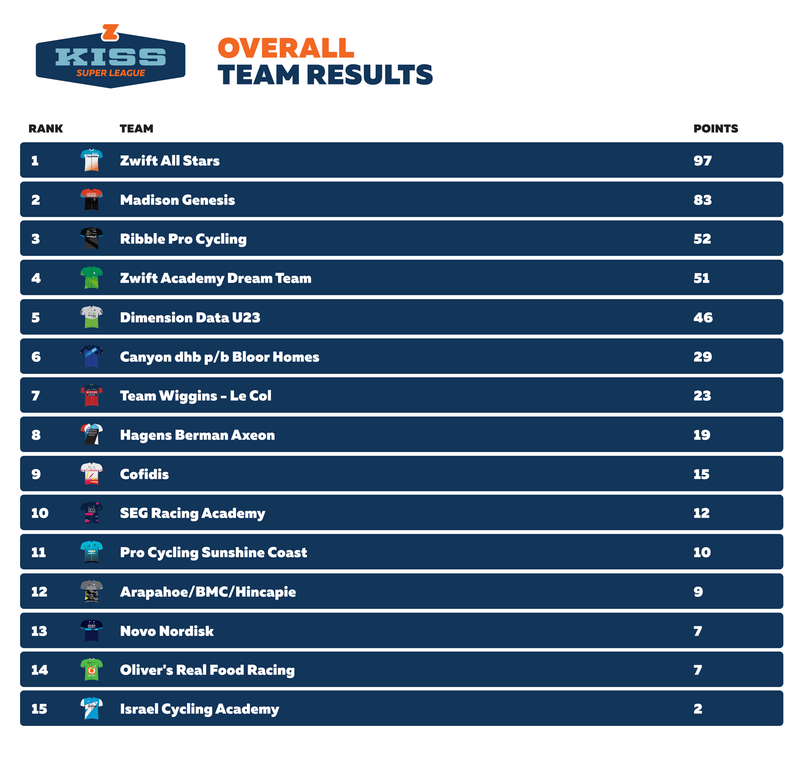 The results move Zwift All Stars into first place in the overall team competition, with previous leaders Madison Genesis now in second place. Ribble Pro Cycling has jumped from seventh place to third. Hopper wrote on Twitter that he didn’t expect his move to stick. He didn’t even expect it to happen! Behind him, the Zwift All Stars team looked to team leaders Madison Genesis to chase Hopper down, said Kim Little after the race. “The win was less important compared to getting more riders in the top 10,” he said. Little said he’s thrilled to win the sprint competition and help his team at the same time. “We weren't targeting the [sprints], but we said if we were near the front and felt good to have a go,” he said. Next Wednesday, the racers will face the Watopia Flat course. Tune in live to see all the action!